Save on blocking and set up fees with our ground level on-site containers. Our ground level office containers are the ideal mobile, temporary, and weather tight on-site office solution for your project management team. 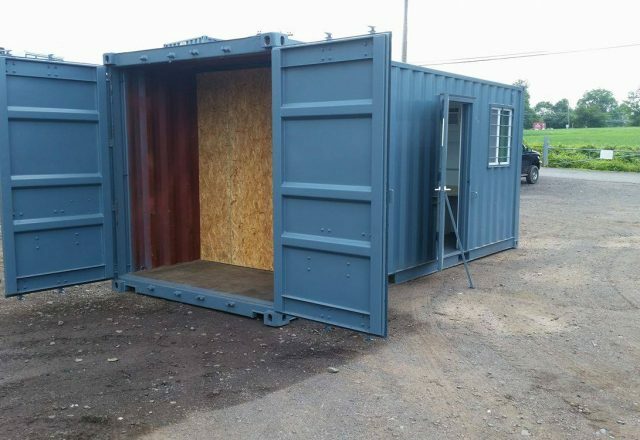 Available for sale and rental, our ground level office containers can be used for construction, renovations, commercial, and retail projects. Containers can be customized to suit job specifications with storage space, office space or combo units. Our full office options are available in 20’ or 40’ sizes and all combo units come in 20’ or 40’ sizes as well. 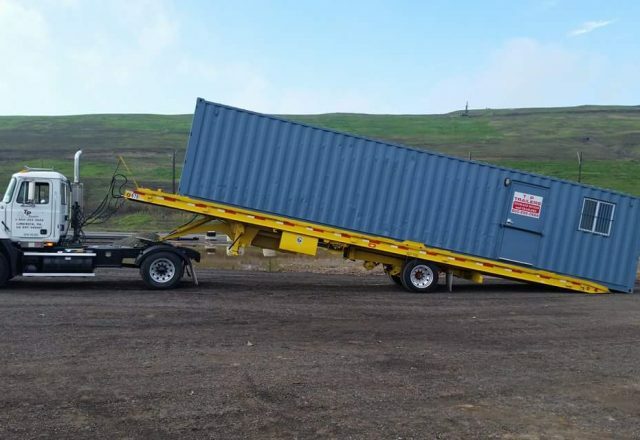 We offer delivery and pick-up of our entire selection of on-site rental containers. Please view our options and contact us with any questions. Our 20’ ground level open office containers are one of our most popular products. This unit is set up completely for office use with two desks and two file cabinets, multiple double duplex receptacles, fluorescent lights, heat, A/C and a plan table. These ground level office units sit directly on the ground and do not require set up fees, step fees or blocking fees. Please call or contact our rental agent for pricing and other information. Our 20’ office storage combo units are perfect for the job that requires an office and storage space in the same location. These ground level office containers do not require the extra set up fees for blocking and steps. These units are outfitted with one desk and file cabinet, multiple double duplex receptacles, fluorescent lights, plan table, shelves, heat and A/C. The storage area is also equipped with double duplex outlets and pipe or shelf racks depending on your specific needs. Please call or contact our rental agent for pricing and other information. Our 40’ office storage combo units are perfect for the job that requires an office and storage space in the same location. These ground level office containers do not require the extra set up fees for blocking and steps. These units are outfitted with one desk and file cabinet, multiple double duplex receptacles, fluorescent lights, plan table, shelves, heat and A/C. The storage area is also equipped with double duplex outlets and pipe or shelf racks depending on your specific needs. Please call or contact our rental agent for pricing and other information. 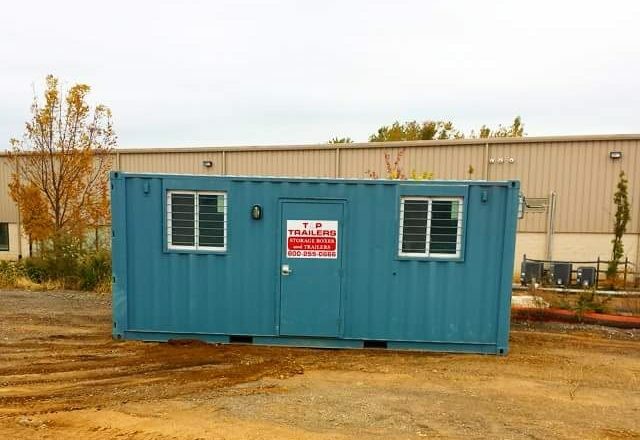 Our 40’ office units are great for any job site. These units are outfitted to have two separate offices equipped with file cabinets, a desk, multiple double receptacles, fluorescent lights, heat and A/C. Both offices are separated by a conference room with a plan table, A/C, heat, shelving, bulletin boards, fluorescent lights and multiple double receptacles. These units are ground level and sit directly on the ground and do not require set up fees or blocking fees. Please call or contact our rental agent for pricing and other information. If you are interested in customizing an on site office, contact us! We have custom storage containers for sale to meet your unique needs.